Vasudeva carrying KrishnaTerribly afraid of Kamsa, Vasudeva, as urged by the Lord from inside, carried the child in his hands, the chains broken. Approaching the doors, the doors flew open. The sentinels were all in deep sleep. Just when Vasudeva got out of prison, Yasoda at Vraja, gave birth to a girl, who was Yogamayadevi. Proceeding further after midnight, gentle showers fell. 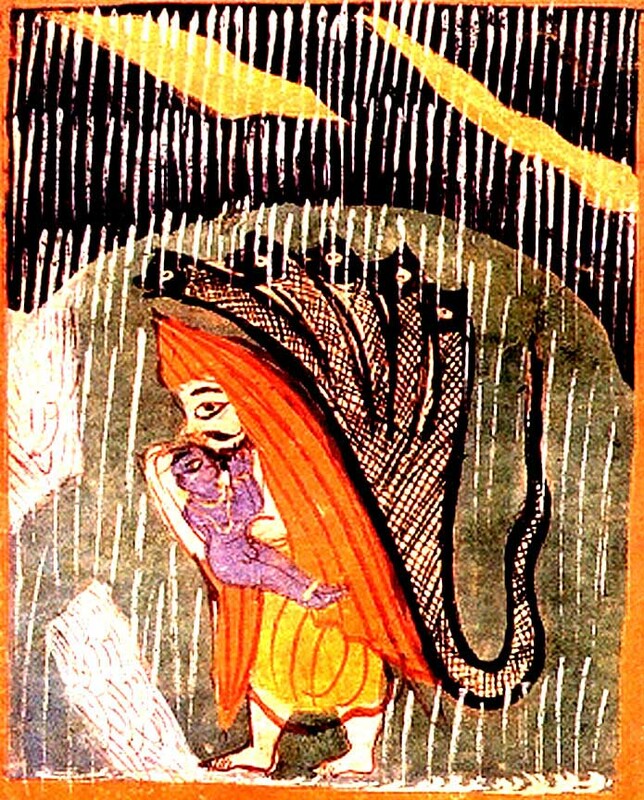 The thousand headed Ananta spread his head over the child protecting it from rains. 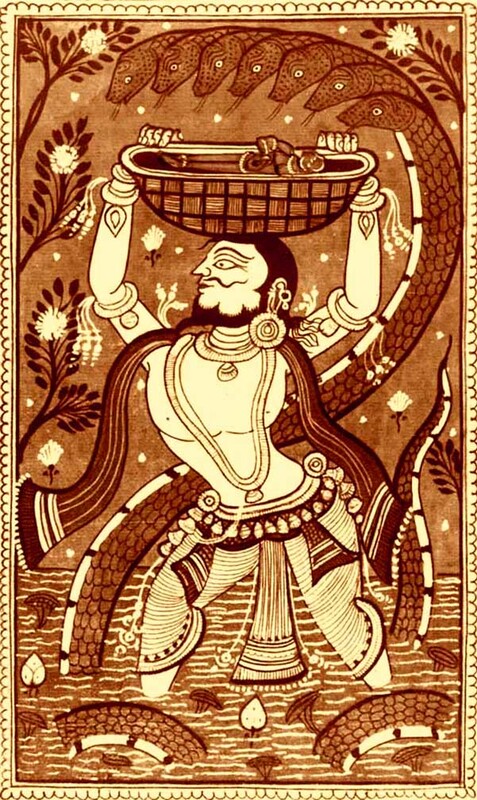 Walking on and on, Vasudeva came to the banks of Yamuna which was in spate, flowing in torrential current. The tumultuous waters subsided to the ankles. Vasudeva effortlessly crossed the river; and reached Gokula. 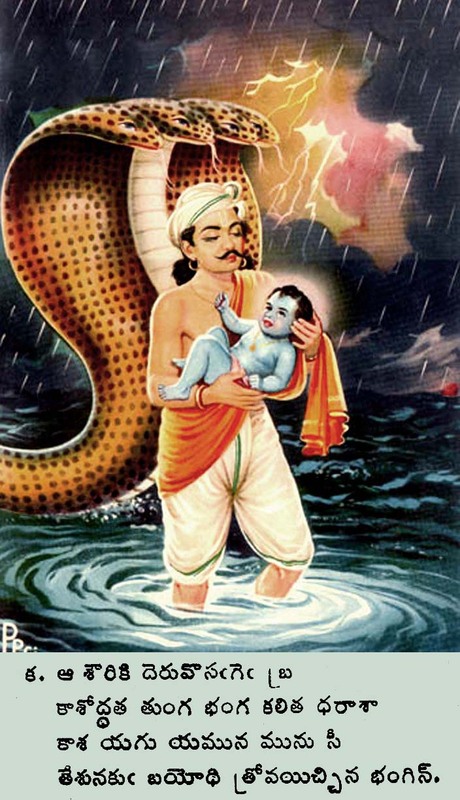 Vasudeva placed the child near Yasoda and took Yasoda’s child in his hands. He quickly reached the prison at Mathura and placed the child on Devaki’s bed. This entry was posted on June 11, 2007 at 6:19 am and is filed under Uncategorized. You can follow any responses to this entry through the RSS 2.0 feed. You can leave a response, or trackback from your own site.